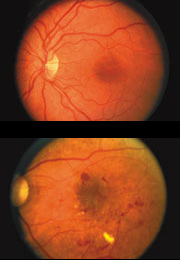 Age-related macular degeneration is an acquired degeneration of the retina that causes significant central visual impairment through a combination of non-neovascular, and neovascular derangement. 2)A retina showing signs of diabetic retinopathy. Posterior Vitreous Detachment (PVD) is a separation between the posterior vitreous cortex and the neurosensory retina, with the vitreous collapsing anteriorly towards the vitreous base. Prevalence of PVD increases with age and with axial length of the eye. PVD affects most eyes by the eighth decade of life. Age at onset is generally in sixth to seventh decade and men and women appear to be equally affected. Weiss ring, ring-shaped opacity located at the rear of the detached vitreous margin optical disc, seen through the slit lamp. Retinal detachment is a sight threatening condition with an incidence of approximately 1 in 10000. (1,2) Before the 1920’s, this was a permanently blinding condition. In the last 50 years techniques in scleral buckling, pneumatic retinopexy and vitrectomy have made the repair of retinal detachments more manageable with better visual outcomes. View these simple tips for maintaining healthy eyes.